Autographic film allows the photographer to enter his own notes onto the negative. Comments are scratched into paper on the back of the film with a stylus and then exposed to the sun and burned onto the negative. It was invented by H. J. Gaisman. 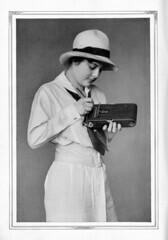 Eastman Kodak purchased the rights in 1914 and produced Autographic film for 8 different negative sizes. 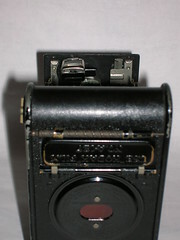 They made a series of Autographic cameras and even replacement backs to adapt older cameras to use this feature. 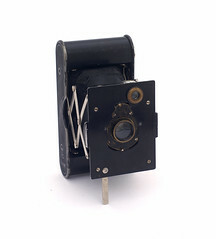 The form of the window can help you date the camera as Kodak produced three consecutive models in 20 years. 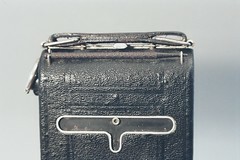 The example shown is one of the later models. 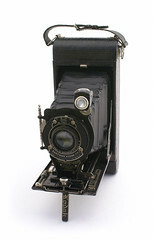 Kodak patents, a collection of over 1,200 patents related to Kodak cameras, including some about autographic cameras and films.